← Cruise Director or Equipper? The idea of Disneyland is a simple one. It will be a place for people to find happiness and knowledge. It will be a place for parents and children to share pleasant times in one another’s company: a place for teachers and pupils to discover greater ways of understanding and education. Here the older generation can recapture the nostalgia of days gone by, and the younger generation can savor the challenge of the future. Here will be the wonders of Nature and Man for all to see and understand. Disneyland will be based upon and dedicated to the ideals, the dreams and hard facts that have created America. And it will be uniquely equipped to dramatize these dreams and facts and send them forth as a source of courage and inspiration to all the world. Disneyland will be something of a fair, an exhibition, a playground, a community center, a museum of living facts, and a showplace of beauty and magic. It will be filled with the accomplishments, the joys and hopes of the world we live in. And it will remind us and show us how to make those wonders part of our own lives. What a vision Mr. Disney cast that day! Though we have the benefit of knowing the wonderland Mr. Disney did in fact create, can you imagine being a potential financier, listening to this dreamer share his bold dream? Would you have caught the vision? Would you have pulled out your checkbook? Would you have climbed on board to make this dream a reality? Who is the best vision-caster I know? Jesus is the first that comes to mind. People are still following him 2000 years later! So, how did Jesus get the first disciples to follow him? Reading about the calling of the first disciples in Matthew 4, it looks pretty easy. Jesus simply said, “Come, follow me and I will make you fishers of men.” However, there is a bit of information left out of that Matthew 4 passage. Apparently, Jesus had been preaching in the area. My guess is that Simon Peter, Andrew, James and John had heard some of that preaching and were compelled by the vision Jesus cast as he spoke of the kingdom of heaven being near. Perhaps Matthew assumed we’d get that and understand, then, how they, having caught the vision, would have dropped their nets and followed Jesus. Do you, like Walt Disney, have a bold dream? It could be anything from ministry to families in an age where family values are challenged to caring for the homeless… from creating a worship experience that truly engages people and blesses God to providing water for villages in Africa. Whatever your bold dream is, how well can you articulate it? The vision-casting competition is tough–just watch a couple of TV commercials or peruse the glossy ads in Sunday’s newspaper. If people aren’t buying into your bold dream, could it be because you subconsciously believe that casting vision is as simple as walking along the Sea of Galilee and saying, “Come, follow me”? Maybe for some it is; but for most of us, it is going to require more effort . Wil Mancini ended his blog post on September 7 with this: “Who do you need to ‘drip vision’ to this week?” It’s a good question. This entry was posted in Leadership and tagged Jesus, ministry leader, vision, vision casting. Bookmark the permalink. The other pieces of this are: 1- make sure the vision is worth dripping/casting and 2- are people following it? Didn’t intend for it to be painful, Rachel! 🙂 It’s really a conundrum, isn’t it? Being in the second chair gives us a unique perspective, but it feels a bit powerless. 1. Is it God’s vision? 2. Am I effectively casting that vision? 3. Am I in the right seat on the right bus (borrowing from Jim Collins)? That last question can be a risky one! Oh… re the quilt patterns–that’s not my work. Apparently someone at WordPress likes quilts as much as we do! PS- Just realized the quilt blocks you are using as graphics! LOVE them! The first person I need to drip vision to is myself – which means listening for God’s vision so that I can drip it to others. Without that God-sized vision and dream, I will accomplish nothing of Kingdom consequence. Thanks for spurring my thinking…and dreaming! Exactly, Rhonda! Considering that Disneyland opened in 1955 and assuming that the dream was birthed a few years prior to that, Walt Disney’s dream was big and bold–to say the least! It is amazing that he was able to pull it off at all! 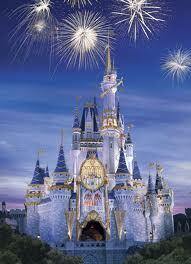 Equally amazing is that approximately 600 million people have visited Disneyland since it opened. Now that was an effectively-cast vision! If Walt Disney could do that, what more can we do in the power of the almighty, omnipotent God-of-All-Creation! Let’s dream God-size dreams! Yes, this stabbed me in the heart as well! One of my big take-away’s from LifeServe was from Sue Nielson Kibbey’s workshop on Leadership. She said the #1 job of the leader is to cast vision. She challenged each of us to find 100 different ways to cast the vision of our ministry. I have been using the same three ways for the past 12 years. And I expect people to remember it on their own. Both are pretty ridiculous now that I type this! I think it takes mulitple people to cast the vision, it can’t be just you doing it. Tracy, I think you make an excellent point that it takes multiple people to cast vision. When others are working with you, there is greater potential for the vision to spread and, moreover, to stick. If it makes you feel any better, both the posts about dripping vision came out of my own deficiency in this area!